Here are some examples of ministries where you can plug in. Just contact the Pastors if you have an interest. In some cases, you may need to have references checked, or background screening completed if you are asking to volunteer with children, teens or vulnerable adults. Our intention is to reach all families and households in Red Wing with support for the healthy growth—spiritually, physically, academically—of every child and teen. 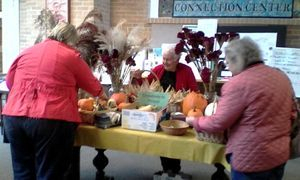 Each year friends and members bring in the bounty of their gardens and we purchase them with a free will offering. Things include vegetables, fruits, eggs, flowers, and ornamentals to name a few. We donate the proceeds to a different mission every year decided on by the church council. We give food to the community food shelf for the families in need in our community and county several times per year. You may contribute food or money through the congregation to sustain households in financial distress. Our congregation hosts a holiday meal on Thanksgiving for anyone who wishes to share in the meal and a time of friendship. We think no one needs to be home alone on a holiday. We love to share and the food is delicious. Our Men's Cooking Team is very active in this ministry. We reach out to the children of our church, and also to children and families from the wider community to offer a full week of fun, adventure, care, lunches and spiritual growth each summer. Volunteers are always needed, and we pre-screen and supervise all leaders. One Friday evening per month, all summer long, we show family-friendly movies at Central Park for free, and we focus worship on that movie on the Sunday afterward. Families enjoy, but also can reflect with us about the movies. Helpers are needed each time. Our Prayer and Care Team, including one or more of our pastors, meets every two weeks to pray for care needs in our church, community, state, nation and world. We also assign pastors and selected volunteers to visit, or call on and provide support to persons or households in need. Justice, peace, human rights, the environment…. We believe that it is not enough for Christians to offer private works of mercy to persons in distress. In these times, public witness for fairness, safety and opportunity is needed. Sometimes this means influencing government, businesses or others to change the way we address public issues. We are willing to be advocates for the poor, for civil and human rights, and for justice in the land, when that is needed. Perhaps God is calling you to serve not only in private or personal charity, but in public policy, advocacy and organizing? We offer relational witness to our own faith and what compels us to do what we do as Christians following Jesus and proclaiming God’s kingdom. We do this in relational ways, listening to others with respect and compassion, while telling our own stories of spiritual experience and faith, too. Anyone who is part of a local church knows that there are many support roles to be filled, and we are always grateful to those who take responsibility for the behind-the-scenes tasks: greeting guests, ushering, picking up, assisting teachers, helping in the office, counting and depositing offerings, accepting elected leadership, etc.